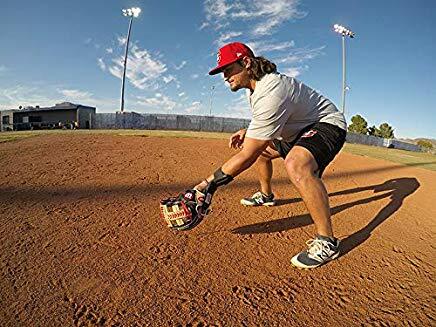 Make your defensive practice much more interesting and fun by implementing the use of baseball fielding training aids! In this post I breakdown 6 types of trainers that I believe every baseball or softball player would benefit from including in their training regimen. One problem that I come across often is that players tend to dedicate the majority of their solo practice time to hitting. While hitting is arguably the most difficult thing to do in all of sports, an appropriate proportion of a player’s training should also be dedicated to defensive work. 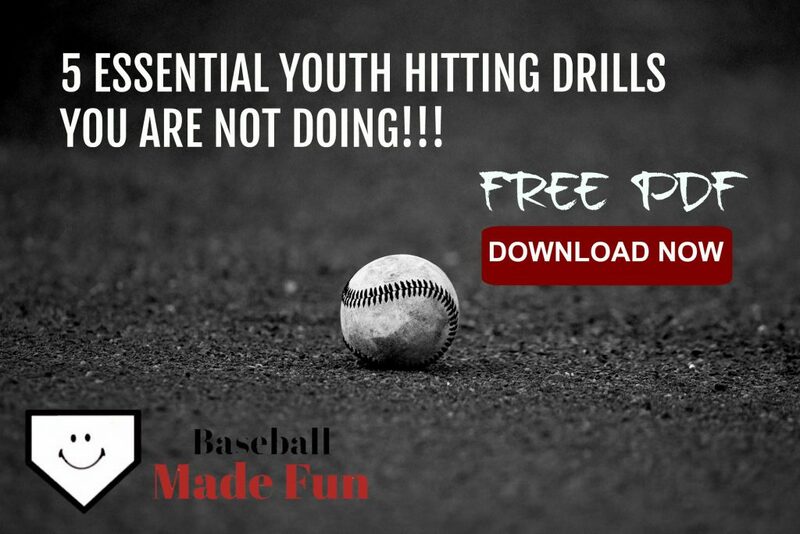 After all, if you can’t field a ground ball, you better be able to absolutely mash the ball! Why not just take your defensive training up a notch with the following tools? If you ever coach or teach infield (and/or outfield), you need to have a set of sports cones. Cones can serve a variety of purposes for the baseball or softball coach. Creating angles – When fielding a ground ball we have two jobs; 1. field the ball & 2. make a throw to a base. Often, young infielders don’t prepare their bodies to make the throw. Instead of taking an angle to the ball that gets them in a good position to throw, they’ll either charge straight at everything (probably a holdover from the tee ball days), or they’ll hardly move their feet and field stationary. Cones are a great way to get an infielder’s feet moving and show them the correct path to take to a ground ball. Make sure you practice all different types of ground ball angles: routine (right at the fielder), forehand, and backhand. You can also use cones to teach outfielders angles to fly balls. Agility – When playing infield or outfield, players need to be light and quick on their feet. They also need to be able to make quick cuts and turns to change direction in an instant. Cones can be set up an endless amount of formations for agility work. My personal favorites are the box and five-star formations. Coaches can have a predetermined path for the players to take in the cone formation, or they can assign the cones numbers and give random commands to the player as they work their way through the formation. You can work on shuffles, cuts, sprints, back peddles, rounding, or any other type of move you can dream up. Footwork efficiency – As infielders begin to develop and get more skilled, there is always room for added efficiency in their footwork. Coaches can use cones as a constraint to force the infielder to make efficient moves with their feet. One of my favorite drills for this is the weaving forehand/backhand drill. The set up is simple. Just put a line of 6 cones about 4 feet apart. The player will start at the back of the line and make their way toward the coach who starts at the other side of the line of cones. The player will weave back and forth as they move through, going from a forehand to a backhand fielding position. The coach will be alternating between rolling a ball on the players forehand side and backhand sides of the cones, rolling 6 balls total (one for each cone in the line). In order to field all 6 balls cleanly, the player will have to have no wasted movements and need to stay low through the entire drill. Pros: Universal. Can be used in as many ways as you can dream up. Work agility, angles, footwork efficiency and more. Stackable. Inexpensive. Click here to check prices on Amazon! Softhands Foam Trainers have been around a long time. They’re inexpensive, portable and light-weight. The design allows them to be used by both right-handed and left-handed fielders. I’d recommend that every coach purchase a set for their infielders. It will be money well spent. Have to use two hands. Must look the ball in. Must keep their glove and throwing hands close together when receiving a throw. Have to catch the ball out in front of their body. Have to get their body down low to field a ground ball. You can use Softhands in place of a glove for any infield drill in which you would be fielding with two hands. I have players use it for rolled ground balls, fungo ground balls, quick toss catch, double play turns and much more. Pros: Easy to throw in a bag and keep around. Light-weight, works for both leftys and rightys. Creates good habits for infielders on two handed plays. Inexpensive option for team infield training. Inexpensive. Cons: Elastic bands will wear with prolonged use, and sometimes break. Harder hit and thrown balls may still sting when fielded with pad. Looking for a way to get your infielders more engaging and fun work at practice? Look no further than the Reaction Ball! The Reaction Ball is made of rubber and has bumps that protrude out on all sides. The bumps cause the ball to bounce unpredictably when it is rolled. The reaction ball would is a great “hands off” station for practice. As you can imagine, players can make all kinds of fun games out of this. Some games they can play are just rolling the ball back and forth trying to get the better of their partner, elimination style games, keeping score of cleanly fielded rolls for their group, etc. Not only is the Reaction Ball fun to play with, it will undoubtedly help your infielders develop their infield hands. Their hands will get quicker, coordination will get better, and they will improve their ability to react and adjust to a bad hop. Pros: Fun and challenging. Easy to use, just roll it! Cons: Not good for hitting. Must be rolled. Can sometimes be too wild. This video will give you some ideas on how to use a few of the training aids already mentioned. Agility ladders are another piece of equipment that I recommend coaches carry in their equipment bag. You can find hundreds of different footwork variations to use in a ladder. Some ladders come with a list of exercises, others do not. But regardless, you can find as many variations as you’d like on YouTube. You can also incorporate more baseball and softball specific movements. Players can use ground ball fielding footwork “right, left, field” and mimic fielding a ground ball at every other rung, or they can alternate between forehand and back hand positions at each rung of the ladder. Another way to make it more sport specific is to actually throw, roll or hit balls to the players while they’re going through the ladder (probably only for advanced players), or right after they come out of the ladder. I use the agility ladder often for both infielders and outfielders. I like to have my infielders take ground balls as they come out of the ladder and outfielders can get a fly ball thrown to them after exiting the ladder. For my advanced infielders, I’ll have them go through a ladder alternating forehand and back hand fielding motions, and actually roll them a ground ball each time. Pros: Inexpensive. Fun addition to warm ups, conditioning. Trains footwork, agility, and speed. Cons: Sometimes get tangled. Young kids can trip and get feet tangled. While they are significantly more expensive, it may be wise for an advanced infielder to get their own genuine leather flat glove, instead of the foam version. The leather flat glove is just like a real infield glove, except smaller and flat like a pancake. Unlike the foam version, they are hand specific. So make sure you choose the correct hand orientation (right hand fielder or left hand fielder). Advanced players can use flat gloves for live ground balls off of a bat or to play catch while throwing fairly hard. The foam versions will not hold up well under those conditions if used frequently. With the leather version, you’re going to get a much longer life-span. It will also protect your fielding hand better than the foam Softhands. So a geniune leather flat glove will be well worth the extra money. Pros: Durable and sturdy. Better fit for individual player’s hand. Will last a life-time if properly cared for. Provides more protection for hand. Cons: More expensive than foam version. Consistency in glove presentation is a big issue with infielders from youth to high school. Often infielders field ground balls with their wrist at an angle, which limits the amount of glove pocket and web that faces the ball. The Libke Pro forces the fielder to keep their wrist straight, thereby presenting the glove to the ball in the most desired manner. Wrist curling during the act of fielding is another common issue among infielders. This can cause the ball to be flipped out of the glove during the transfer. The design of the Libke Pro prevents the fielder from curling their wrist at this phase of fielding as well. While the creators of the Libke Pro had glove presentation in mind when designing the product, the training aid has since proven to provide additional benefits. Because of the forced correct hand and wrist posture, fielders will feel uncomfortable if they do not get their body down low and field the ball out front. Bonus! Pros: Promotes good fielding habits naturally. Player can use their own glove. Works for forehands and backhands. Comes in adult and youth sizes. Cons: The most expensive item on our list. I like to play baseball sometimes and to be honest, I have never seen these training aids, I like it! And you have a great article to describe all these training aids, thank you for this awesome review! I think reaction balls is the most interesting thing to me! Libke Pro looks amazing but like what you said, just too expensive! Thanks for checking out the article! Glad you liked it. Yes, I’ve used the reaction ball before. It is a lot of fun. You don’t even have to be a baseball player to have fun with one of those! Thanks, Adam. I’m glad you liked the article. Yes, training aids are definitely helpful tools for coaches to utilize. Just telling a player what to do, often does not work. A training aid can really make the coaching become easier. These base balls are all interesting. I have played some of them but I was not too good at playing because I started not long ago. I have played reaction ball and it is easy and engaging. Another game that interests me is sports cons but I really need to improve on my agility and how to make quick cuts as well as in my frame work too. They are all interesting games but I will have to improve in the ones I have started already. Hi Kenechi. Keep practicing! These tools will definitely help make your training more enjoyable. Awesome article highlighting some of the training aids you should be using while paying baseball. My son loves baseball and I now have some knowledge as to what training aids I should be buying for him. The training glove my son currently uses is quite stiff with no pocket. I think its time for me to invest in a genuine leather flat glove even though its more expensive than the foam version as you have mentioned in your post it can even last a lifetime. So it does offset the cost factor. Hi Nick. Glad to hear your son has taken a liking to baseball! A leather flat glove would be a great addition to his practice. It is said that Michael Jordan tried out baseball upon his retirement from basketball, the game that he excelled in. However, he had challenges hitting the ball and never made it past low minor leagues. This shows how hard baseball can be to catch up with even with the athletic ability you may have. The videos helped he appreciate the application of the 6 baseball fielding training aids needed to quickly adapt to the game. I highly recommend this site for newbies to the game since it provides the right detailed information on how to get started. This post in particular helps you build your defensive techniques which is a great element to the game. Thanks, Edgar! Yes, it’s a difficult game, especially for newbies. I think MJ did a pretty good job considering how long it had been since he played baseball. Glad you like the site.